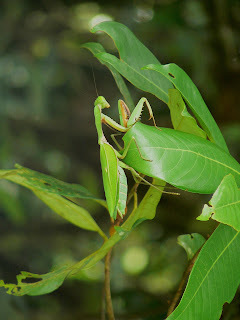 Nature's camouflage in action - this Praying Mantis (such a descriptive name) blends in so well against the green leaves. This one's about 8cm (3 inches) long. Postscript to my last 'Dove Orchid' blog - some light showers finally caught up with us but thankfully nothing serious so our post-wet-season clean-up continues. Finally Peter's managed to mow most of the long, long grass for the first time in several months! But the saga of break-downs continues. Last week we eventually got the repaired pressure-water-cleaner back - a 'must-have' in the tropics - but now the Landcruiser has problems, the spa motor which has been working perfectly while no-one has been staying has packed up just in time for Easter guests, and now an attachment to the tractor is broken. Sigh!